At the 2013 Geneva Auto Show, Volkswagen showed off a concept vehicle, the first Commercial concept to be imagined by the German automotive company. It is called the e-Co-Motion and it is designed to be a zero-emission delivery van for transporting goods around a city. It is exclusively electric-powered that boasts a range of up to 124 miles. Powered by a compact drive unit with a continuous power output of 50 kW (68 hp) and maximum power of 115 hp, the vehicle boasts maximum torque of 270 Nm, which Volkswagen says provides responsive acceleration even when the van is packed with a heavy load. While designed for ferrying goods around town, the vehicle’s electronics don’t limit its top speed until it hits 75 mph, allowing it to take city motorways and short intercity routes when required. 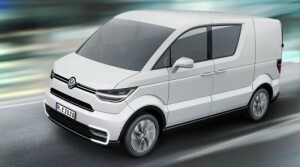 Volkswagen Commercial Vehicles hasn’t made any commitments on whether the e-Co-Motion will make the jump from concept to production vehicle, but one of the goals of the project was to develop a uniform platform that could be implemented as the basis for as future vehicles.